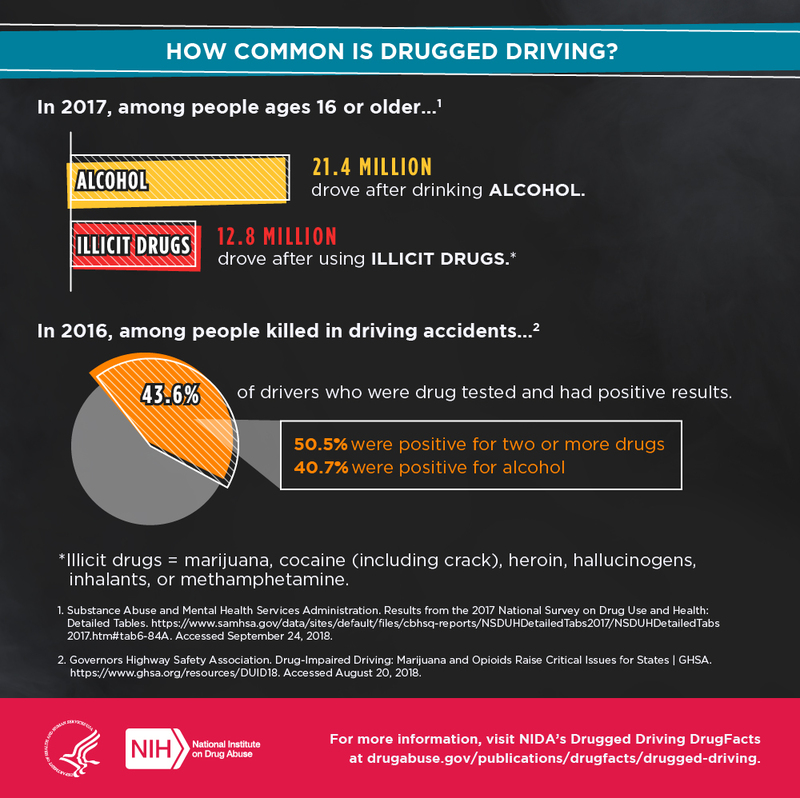 What is Drugged Driving? Driving while under the influence of legal or illegal substances. It puts the driver, passengers, and others who share the road in danger. It is illegal in every state. 21.4 million drove after drinking alcohol. 43.6% of drivers who were drug tested and had positive results. 40.7 % were positive for alcohol. * illicit drugs = marijuana, cocaine (including crack), heroin, hallucinogens, inhalants, or methamphetamine. What are effects of Drugs on Driving? 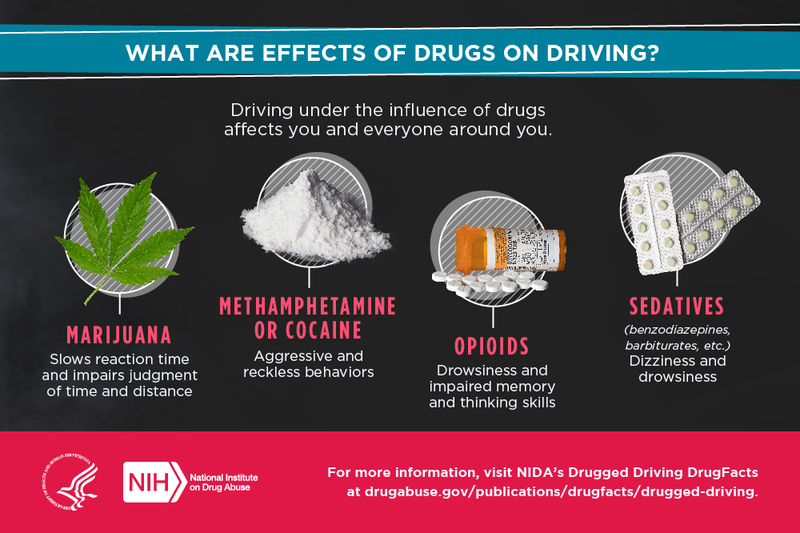 Driving under the influence of drugs affects you and everyone around you. Have a designated driver take all car keys. Get a ride to and from parties where there are drugs and alcohol. Avoid going to parties where alcohol and drugs are present. 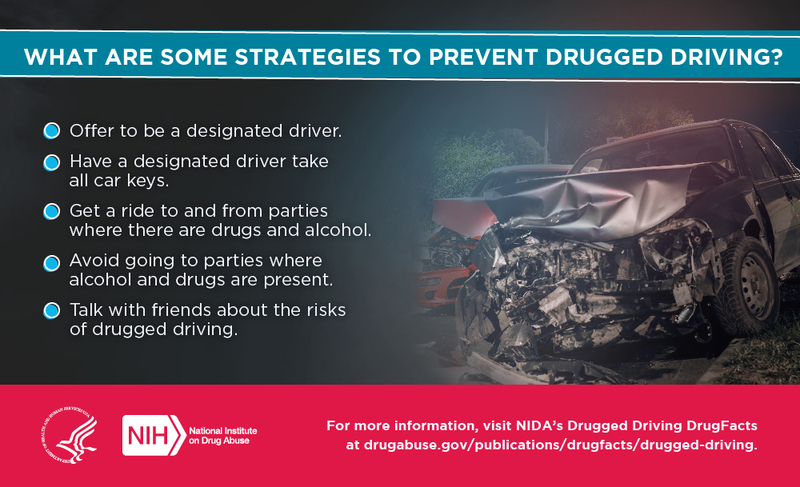 Talk with friends about the risks of drugged driving. 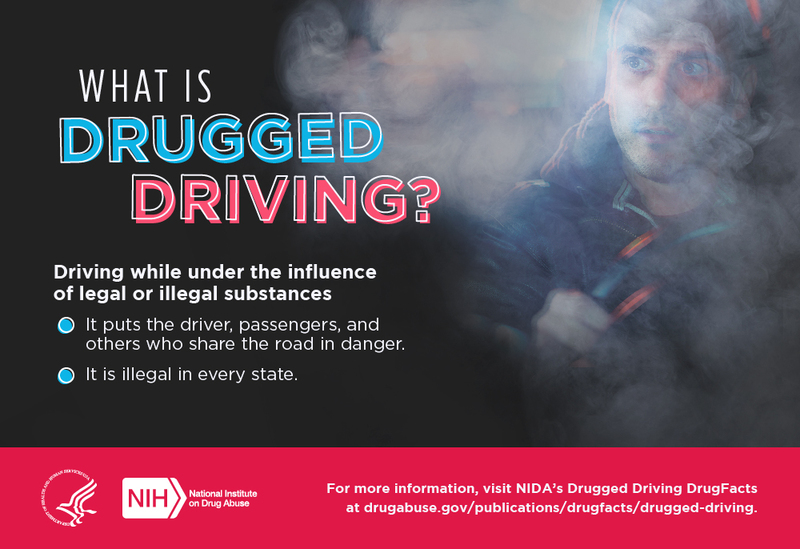 For more information, visit NIDA’s Drugged Driving DrugFacts at drugabuse.gov/publications/drugfacts/drugged-driving. Substance Abuse and Mental Health Services Administration. Results from the 2017 National Survey on Drug Use and Health: Detailed Tables. https://www.samhsa.gov/data/sites/default/files/cbhsq-reports/NSDUHDetailedTabs2017/NSDUHDetailedTabs2017.htm#tab6-84A. Accessed September 24, 2018. Governors Highway Safety Association. Drug-Impaired Driving: Marijuana and Opioids Raise Critical Issues for States | GHSA. https://www.ghsa.org/resources/DUID18. Accessed August 20, 2018.